A liturgy, a litany, a laud, THE GREETING FROM MY MOTHER traces the sublime and almost invisible bonds of motherhood, daughterhood and sisterhood over "one hundred years and two world wars." Familial rites and rituals converge in the form of nebulous belief (sometimes objectively, sometimes as metonymy). Images whisper by, like rosary beads, pointing to an underlying message, a personal conclusion: the specifics are secondary, it is in reverence and repetition that salvation can be found, that an anchor can be grasped, that a weather candle can be lit. Katja Straub is a native of Southern Germany and is currently pursuing her MfA in Film Production at the University of Texas at Austin. Before moving to Texas, Katja spent 10 years in Berlin freelancing as an art designer and painter for films and music videos. She also held an apprenticeship as a scene painter for the German Opera. 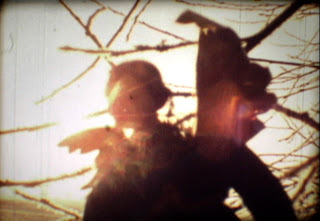 She is a graduate of the University of the Arts in Berlin, where she received her Master in Experimental film. Her films have been screened in numerous festivals around the world including the Images Festival in Toronto, the Viper Basel in Switzerland and the Museum of Modern Art in New York. For her film “All White People Are French” she received the Special Jury Award at the South By Southwest Festival in Austin in 2005. American morality tale, with a female reporter’s voiceover about disguising herself as a soldier, takes place in a typical motel room. 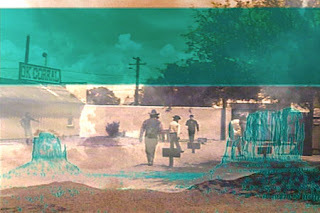 Appropriated cinematic images mix with landscapes of New York, Monument Valley, and Tombstone. The historic gunfight at the O.K. Corral, portrayed in numerous films, has come to symbolize the struggle between law-and-order. Stories about “how the West was ‘won’” parallel those about conquering “the enemy”. If this was the television/entertainment staple for the American public what effect did its continued broadcast have in shaping our society’s mindset? A psychedelic journey of self-discovery through virtual space of the imagination, a landscape of the mind- and of the unknown. Our heroine Metalmags is a wandering minstrel, a lost soul, glam rocker,a psychonaut, a superhero, a mime, a depressed 20-something – any and all apply. At first, she is without hope – stranded in an alien world- haunted by memories of another time and place. But with the aid of a self-help tape, her persepctive and the course of her path are transformed. Troubadour's hand-crafted lo-fi sounds and visuals offer an intimate view of the emotional realms of consciousness and creativity. A meditation on soul-searching in an age of anxiety, Troubadour is on your side. Erica Magrey is an artist and musician exploring the ways in which fantasy shapes reality and identity. Much of her video work takes a cue from sci-fi and kids' TV shows, employing costumes and handmade miniature sets to portray alien worlds and beings. Erica often uses the perosna Metalmags, a kind of caricature of her music project of the same name, in her work. Erica has a BFA in Photography from Hartford Art School in Bloomfield, CT and an MFA is Photography, Video, and Related Media from SVA in NYC. Erica lives and works in New York. nature nature (2005) 1:57 min. Based on a haiku by Simon Baron, nature nature portrays a very real, present and no less natural underside of existence that remains outside the embrace of those who declare a “reverence for nature.” A graphic image of the aftermath of “cutting” (self-mutilation) is softened, prettified and bloodied again in unreal computer graphication; a mechanical songbird is the subject of a childlike poem and sweet Grimlike unjust desserts in reverent uneven burlesque of Hitchcock and horrorfilm. Marianne Faithful sings. Hilda Daniel is a multi-media artist based in New York City (her permanent home after a childhood in Singapore and adolescence in Hollywood). 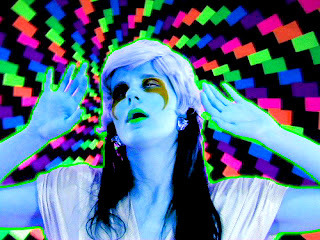 Her work has been exhibited in solo and group exhibitions and festivals in New York, London and other cities, included in internet and print projects, broadcast on cable television and reviewed in the New York Times, Performance Art Journal, New Art Examiner, artnet.com and other publications.